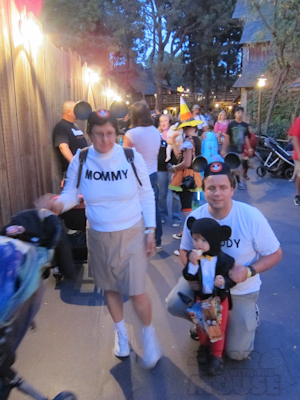 Monday night we had a blast at Mickey’s Halloween Party. What is Mickey’s Halloween Party? Glad you asked! MHP is a separate event from a regular day at Disneyland. It’s in the evening from either 6-11 or 7-midnight and requires a separate admission ticket. It’s kind of a bummer to buy an extra ticket when you’re used to just getting in with your annual pass, but it’s pretty awesome if you don’t have an annual pass because you can enter the park 3 hours early which means that you get 8 hours at the park for the price of the MHP ticket, which is discounted depending on day. The annual pass discounted price for Monday was $44, so given that a regular single park single day ticket is $80, that’s a significant savings. That savings allowed us to share the park with my mom and dad. They’ve been wanting to visit with us, but it’s a hefty investment, especially when Theo is too little to really make it through a whole day. I realize I haven’t told you what it is though. Gimme a sec. I’ll throw in a picture. 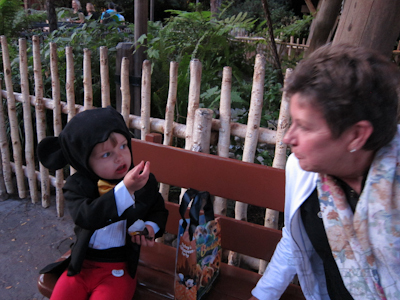 Oh em gee, is that mouse ears and a tux jacket??? 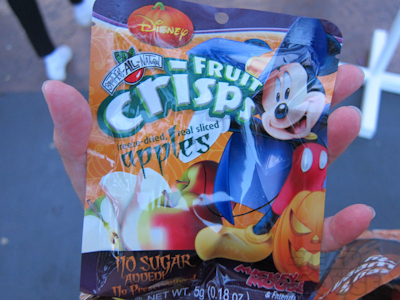 Mickey’s Halloween Party is a private, after-hours event at the park. What makes it different? Well for one, everyone including adults can wear costumes. 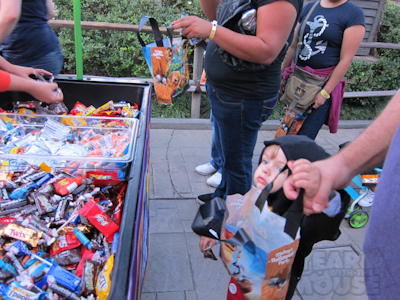 They also have trick or treating with lots of trick or treat trails (treat stations) all over the park. 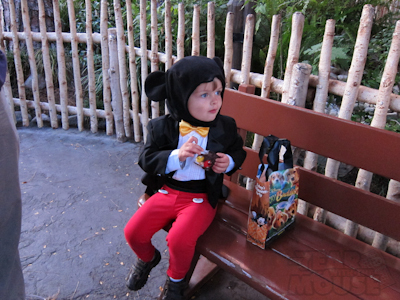 Tuxedo Mickey Mouse, also known as Theo, wasted no time in insisting on sitting down and enjoying his first treat. Grandma and Grandpa got him started on M&Ms. Mommy would have gotten him started on raisins. Fortunately, Theo is very generous when he wants to be. 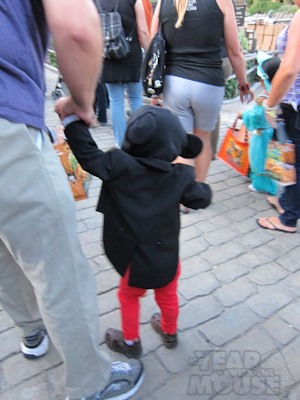 Oh, and a special moment when we were first walking through the park, Theo’s got his costume on and a cast member walking by said, “Oh! It’s the boss!” Very fun. I decided that Mickey needed some appropriate chaperones. A friend suggested we go as old-school Mouseketeers, so we did! Anyway, you get the idea. I took black felt and cut out our titles, then ironed-on Kevin’s, which held decently until the end of the night when his Y started falling off and Theo kept repeating “Uh oh! Fix Daddy Y!” I quickly realized I wouldn’t be able to iron on the letters on my uber-stretchy shirt, so I sewed them on. Seriously, making our costumes took three times longer than assembling Theo’s. Because my mother-in-law made the mouse ears hood. So they also had characters out wearing their Halloween costumes. We went to visit Pooh and Rabbit. Hugs for Pooh! Rabbit too! We waited in line for Mickey and Minnie too, but that took forever. Kevin and I waited in the line while Theo, Grandma and Grandpa went to the trick or treating station at Big Thunder Ranch and when they returned, we’d moved like 2 feet. About 10 minutes into it, we had a good 10 minutes left, and then the cast member said that Mickey and Minnie were taking a quick break and would be back in a minute. They weren’t. 5 minutes later we decided to ditch the whole idea and do something else. 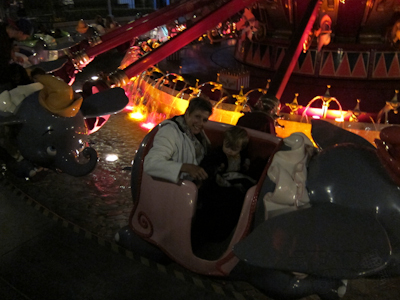 That something else was Theo’s now-favorite ride, Dumbo! The trouble with Dumbo is that the wait is always so long. Because they load and then ride, the line only moves in chunks, and that’s hard for a little guy who has a hard time waiting. 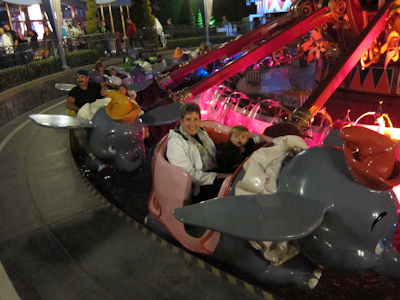 The cool thing about the Halloween Party is that the crowds were reduced, so we only waited about 10-15 minutes for Dumbo. 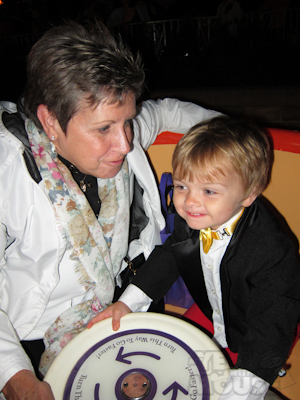 Theo wanted to ride with Grandma. The Mousketeers decided to share an elephant as well. Sometimes it can be so hard to get a kid to smile. After Dumbo we walked right over and caught the special Halloween parade, which is something exclusive to the Halloween Party and was really awesome. I’ve got a bunch of pictures of that so I’ll make that a second entry. 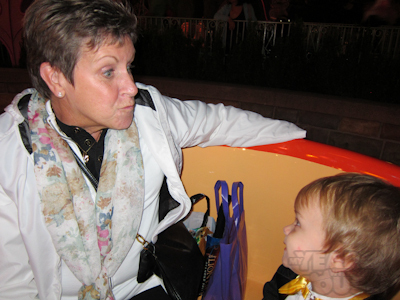 Following the parade we hit another one of Theo’s favorites, the tea cups. The two out of four adults who don’t get sick on the ride accompanied him. That left me and Dad on the sidelines. Theo really likes to turn the cup. Don't you hate catching those awkward moments? And then someone goes and puts it on their blog? I hate that. We wanted to go on another one of Theo’s favorites, It’s A Small World, but it was closed for the party (as was Toon Town). Most of the rides were open for the party though (the train was another that was closed). 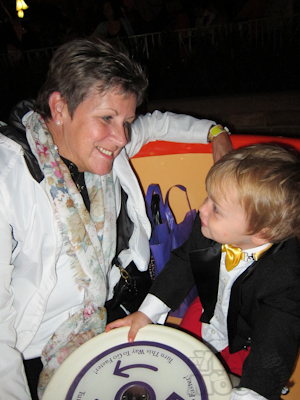 So we headed back to Tomorrowland for yet another one of Theo’s favorites–Autopia! Finally, Theo got to ride with Grandpa. 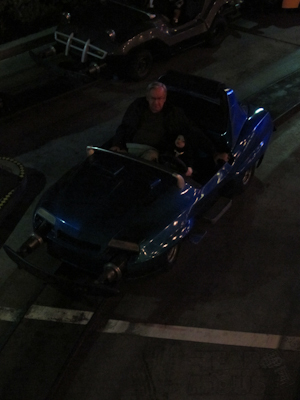 And seriously, Autopia is one of the hardest rides to photograph, especially if your driver is short. There were fireworks after that–another Halloween Party exclusive. I’ll talk a bit about that in the next entry too. Then after the fireworks, mom, dad, and I headed to Star Tours which I promised wouldn’t make them sick and then my dad came out in a cold sweat but claimed to still have a good time. Kevin and Theo went on Buzz Lightyear Astro Blasters (wait for it…wait for it…another one of Theo’s favorites) and then the Astro Orbitors. After that the three of us were tapped out so I made my parents PROMISE me they would go on the Haunted Mansion and Kevin and I headed home. And once we got to the car I realized I’d lost my car keys. Fortunately when I went back the next day, they’s found them (on Star Tours!) and I got them back. What a relief! Great pictures, great post Shelby! Thanks Kelli! I think Katie would really enjoy it. On the AP website it says when the discounted AP days are. I think they did a great job making it worth the extra money. 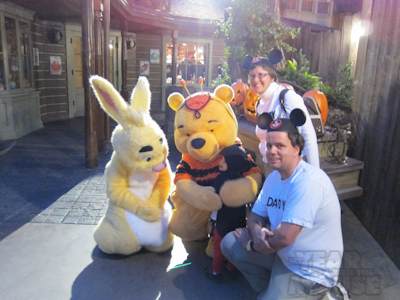 The picture of the three of you with Pooh and Rabbit is fantastic. 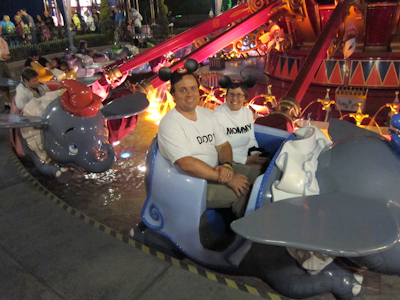 You and Kevin make great Mouseketeers (isn’t that what you’ve always wanted to hear? 😀 ), and Theo is super stinkin’ adorable in his outfit. This looks like a really fun time, and I’m glad you were able to get there for it. It sounds like Theo was well-behaved, which is always a great thing, and enjoyed it as much as you did. Theo does pretty well–it’s important, and this is my advice for any parent, to know your kid’s limits. He had a complete meltdown on the parking lot tram and getting into the car so sometimes you don’t realize your kid’s limits until after the fact 😆 but he did really well at the park, so we had a great time. Thanks for the compliments about our costumes! I think they turned out well. Thank you! I could tell a lot of people didn’t get it, but the ones who did gave us a lot of smiles and we heard some behind-our-backs compliments. And one couple said right out “Great costumes!” which is always fun :). Star Tours kept my cell phone! I think that attraction likes guest momentos. How awesome that you got your keys back! Theo’s costume is amazing, as were yours. Your parents went as… Grandma & Grandpa? Yes, the grandparents costumes were very carefully selected, and I think they carried them off well ;). Love those clever costumes! Not to be completed sad at math, but did each of you shell out $44 to attend the Halloween party? Thank you! Yes, I was unclear on the cost, but it was $44 per adult. So $88 dollars for Grandma and Grandpa both was a great deal for them, but $88 for two people with annual passes, not such a great deal for us. But it was worth getting to see the park with my parents and having them spend special time with Theo. And Theo was free because he is under 3? I’m thinking about sending Annika in by herself before she turns 3 on Friday. Maybe Theo and Annika can go together? I mean we’d be responsible adults and wait right outside the park to pick them up at 11pm…. I think if you go on a weekday other than Friday, it’s not crowded at all. We walked right from Dumbo to the parade about 3 minutes before the parade reached that section and had no problems seeing the whole thing from where we were standing, so even the parade route wasn’t crowded like they normally are. If you don’t have an AP it’s a super-good deal as well, if you go in those 3 hours early. It’s really a lot of fun and they have additional decor for the party as well! I’d been thinking about taking my daughter as well. She’s almost 4 but I’ve kind of decided not to as I think it would be too late for her. I love your costumes! Very clever. I’m suprised to read that you didn’t think it was too crowded. It seems like all the disboards posts were saying that it was very crowded. Maybe the rides aren’t so bad but the more halloweeny stuff (villians meet and greets, haunted mansion) was? Anyway, looks like you guys had a great time. It has me somewhat rethinking my choice to skip it this year. I think she would like it but it is a late night. I’ve seen the posts on the disboards but they’ve all referred to Friday nights. I think the Monday made a huge difference. The wait to the villains M&G was definitely long but we could have held out for Mickey another few minutes if he hadn’t taken a break. The Haunted Mansion looked like a short wait too. I really think the weekday made a big difference, and maybe also because it’s so early in October. Maybe next year for you and DD? Lovely pics thanks for sahring and putting a smile on my face!